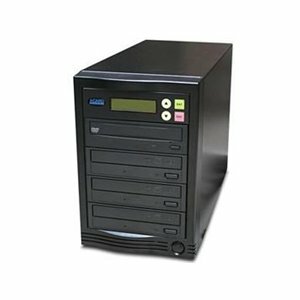 This unit comes complete with 4 Sony Bluray Writers to allow you to easily duplicate data from 1 original disc to 3 blank discs. The device is also backwards compatible allowing you to create both CD and DVD media! The Acard ARS-2053PA is a standalone copy controller supporting high speed SATA Blu-Ray/DVD/CD writers. With its Acard RISC engine, it doesn't need connecting to a computer and has a very shallow learning curve. By simply using the LCD and buttons on the front panel you can use the copy controller to back up data, audio or video Blu-Ray/DVD/CD quickly. Suitable for general office use.